How crazy good does that sound? Over the years, after high school, I tried to visit Israel at least once a year. I wanted to keep my connection and love for Israel strong and I still had so many friends from high school there that I would go visit. Every time I was there, I would stay at friends and make my way around Israel and through that went to lots of Israeli restaurants. One of my favorite items to order was always a halloumi salad. Every place would make it different but that basic taste of the crispy and salty halloumi usually with a sweeter salad was just irresistible to me. And of course, in my mind, I was being super healthy with my order of a salad. Back in New York I would always look for halloumi cheese, but could never seem to find it. I didn’t have any middle eastern specialty stores near me and no big stores carried it. So every time I would forget about halloumi cheese and just wait until my next trip to Israel. 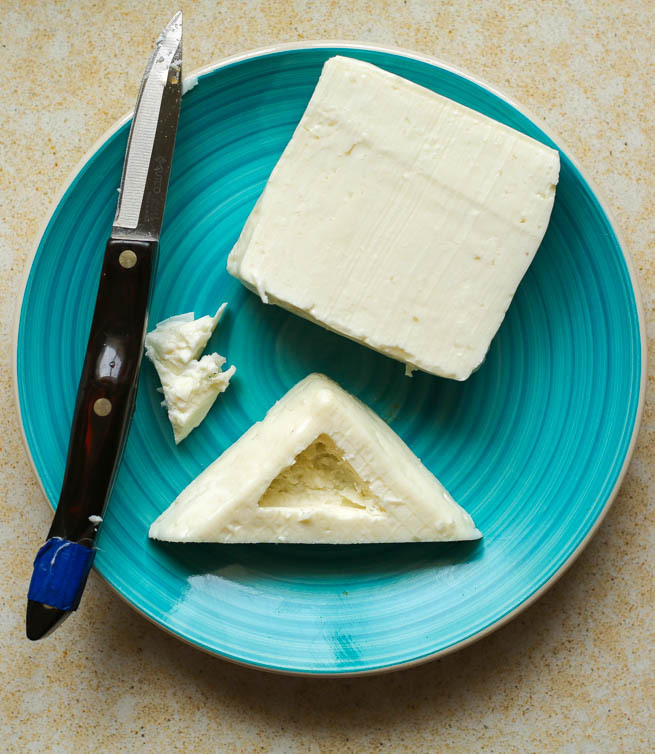 Now that I live in Israel, halloumi cheese is a staple in my house. There is always a block in my fridge as it takes forever to spoil so it can stay for a while until I am in the mood! When I was thinking of hamantaschen ideas for this year, I really wanted to explore my new Israeli self and had a few ideas. Of course, Halloumi cheese came to mind. Besides for its obviously delicious taste, it retains its texture and shape when heated, perfect for hamantaschen making! It’s wonderfully salty flavor would pair well with a sweet tomato jam filling, keeping with the hamantaschen tradition. It has a hint of sweetness and is still bright and fresh from the lemon juice – a perfectly compliment of flavors! This is definitely a hamantash you want to make this Purim! While it looks complicated, the tomato jam can be made up to a week in advance and you can cut the halloumi shapes the night before. All that needs to be done before serving them is a quick dip into seasoned flour and fry until golden. Serve over some greens with just a drizzle of olive oil and some S&P. Heat up the olive oil in a small sauce pan. Add in all the tomato jam ingredients and cook over a low flame. The tomatoes will start to break down and turn into a jam. Meanwhile shape your Halloumi. Slice your block into 1 inch slices. If your block is square like, slice each slice diagonal to form triangles, otherwise play around and form as many triangles as you can. 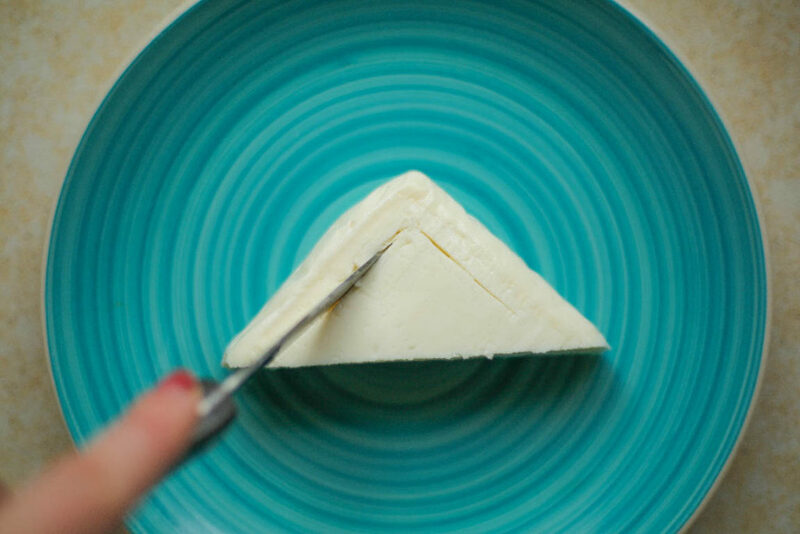 Lay each triangle flat and using a small knife, cut a smaller triangle in he middle, making sure not to cut all the way through, remove the extra cheese to create a triangular indent. 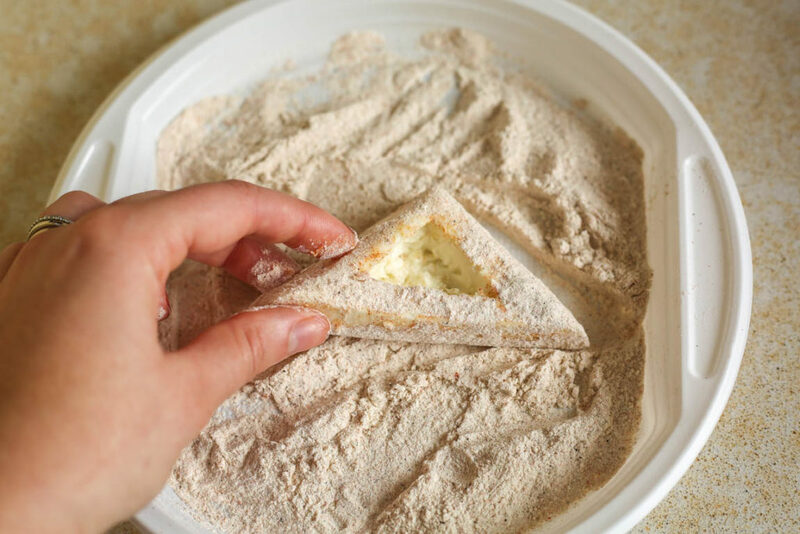 Combine the flour with all the seasonings. Dredge the triangles through the flour, making sure everything is coated, including the sides. Heat up the olive oil in a frying pan over a medium flame. When the oil is hot lower the flame to small and lay the Halloumi slices in the oil, indent side face down. 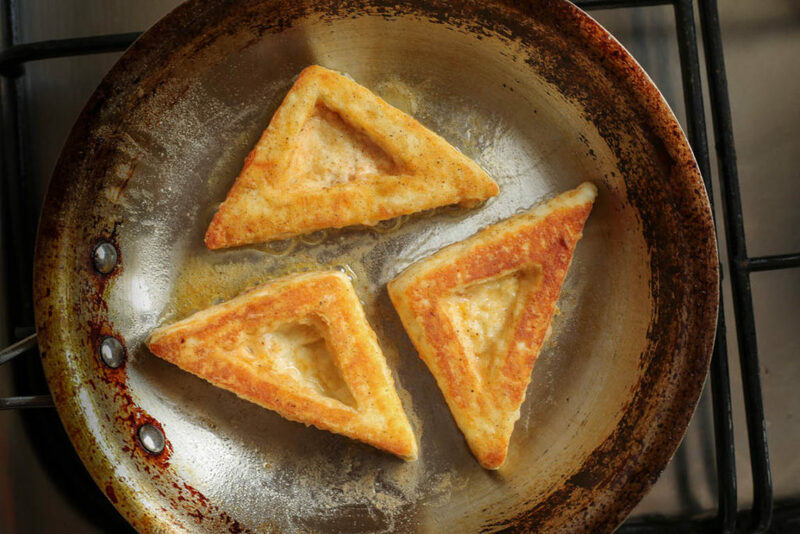 Fry for 3-5 minutes until golden and crispy and flip the triangles. Repeat until the other side is golden. It is very important to keep it on a low flame otherwise the flour will burn. 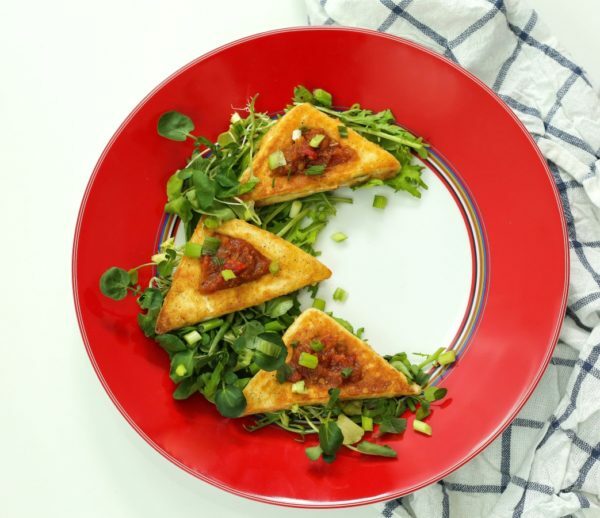 Place the tomato jam into the indents and serve the hamantaschen over some greens dressed with a little olive oil, sea salt and freshly cracked pepper.